Cameron King is congratulated after scoring his second try in as many matches. PIC: Ash Allen/SWpix.com. Featherstone Rovers' overseas imports starred as they got their Championship campaign up and running with an emphatic victory over Batley Bulldogs. In a largely-scrappy opening 40 minutes, tries from Watson Boas - who also added two conversions - Thompson Teteh and Cameron King laid the platform for Rovers to secure their first victory under Ryan Carr. Watson Boas opened the scoring for a second week running. PIC: Ash Allen/SWpix.com. Batley were no pushovers, however, as they recovered from a six-point deficit to lead midway through the first half. But in a first period that was littered with penalties and knock-ons, it was Rovers who went into the interval with the advantage. They started the second 40 as they had finished the first, running in more points to claim their first victory of the Championship campaign. It leaves Batley - who haven't won at Post Office Road since 2013 - without a win in their opening two league games. Brad Day scored against his former club on his 100th career appearance. PIC: Matthew Merrick. In fact, Featherstone have now won the last six meetings between the sides, with the Bulldogs' last victory in this fixture coming in an 11-10 win in the 2016 Qualifiers. The home side were boosted by the inclusion of Brad Singleton in the starting line-up, on dual-registration from Leeds Rhinos. The naming of Ase and Watson Boas and Daniel and Cameron Smith in the 17-man squad meant Featherstone had two sets of brothers in the same side for the first time since 1979. Rovers got the first points of the game when Cameron Smith drew a few Batley defenders before laying the ball off to Watson Boas who plunged over for his second try in as many matches. But it wasn't long before the Bulldogs had reduced the deficit as Dane Manning grubbered in behind for Johnny Campbell who gathered and dived over on the left. And the visitors went in front when French half-back Louis Jouffret capitalised on an error from the hosts. Rovers lost the ball 20 metres from their own line and Jouffret was there to pick up and nip over out wide to put Batley in front. Ryan Carr's men responded well to going behind and soon regained the advantage just after the half-hour mark. Luke Briscoe looked to get over out wide only to be denied. The ball found its way to Teteh who spun out of the tackle to ground the ball over the line. 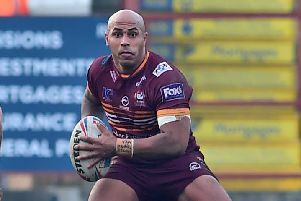 As the half reached its conclusion, King sent the Batley defence the wrong way with a dummy from acting half before racing over close to the posts. In his first game since signing a permanent deal with the club, Josh Walters grabbed the hosts' fourth try of the afternoon early in the second half. Ase Boas's delicate kick to Conor Carey was palmed back by the winger to Walters who strolled over on the right. And the home side were further in front soon after as Singleton took a short pass to crash over next to the posts. Brad Day got in the action just minutes later as he dove on Watson Boas's grubber kick to mark his 100th appearance - 93 of which were for Batley - with a try. It got better for the home side when Calum Turner broke through the defence before sending Cameron Smith racing clear for Rovers' seventh try of the afternoon. Ase Boas rounded off a brilliant afternoon for the hosts as he caught the Batley defence napping to stroll over with three minutes to play. Danny Yates added a late consolation as he pounced on a loose ball after a mix-up in the Rovers defence. Featherstone Rovers: Turner, Briscoe, Teteh, Walters, Carey, A. Boas, W. Boas, Ormondroyd, King, Singleton, Day, C. Smith, Lockwood. Subs: Davies, Cooper, Maskill, D. Smith. Batley Bulldogs: Scott, Reittie, Wood, Smeaton, Campbell, Jouffret, Brambani, Gledhill, Leak, Everett, Manning, Downs, Dickinson. Subs: Brown, Ward, Yates, Brearley.